I was expecting a lot from this due to the oh so popularity of the aformentioned two. But I was little disappointed. It has a very small head, but a lovely golden amber colour. Smells hit me like when you’ve not had a beer in a while. I was excited to taste it because of this. Anyway, the taste was a bit standard. Malty and very much like I would imagine an organic ale to taste, a bit from the earth if there is such a taste. It is a little bitter, but not overly, and somewhat tangy. Overall I wouldn’t buy this again, its okay as a ‘reserve’ beer, but not at all what I would go for first. 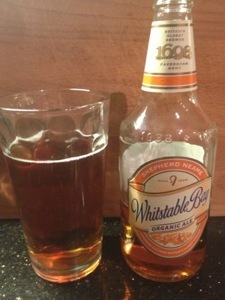 This entry was posted in beers and tagged neame, organic, shepherd, whitstable. Bookmark the permalink.